As much as I love our little home, it has definitely been a challenge organizing and finding room for a lot of our things, not just because of its size, but also because of how the house is laid out. It’s a cape cod, so on the upper level we have a curved staircase to contend with when moving furniture, and the upstairs bedrooms have a pitched ceiling, which makes it hard to fit and arrange furniture. Our basement also has a low ceiling and narrow staircase, so getting things downstairs can be a challenge. So that leaves us with the main level as the only floor where we can really fit a lot of our furniture (such as this ginormous treadmill that for some unknown reason we decided we really needed). Obviously right now there’s no room for a craft area (though I am working on that). But guess what, I am certainly not about to let that stop me from creating and DIYing! I just have to be creative about where and when I get my craft on. Even if you live in a smaller house, you have a lot more options than you realize! Finding a place to craft is really all about finding and making space. All you really need is a flat, level surface. If you look around, you will find that your home is actually full of places to craft! 2. The dining room: Here is another great space to create your crafts. This is prime real estate just begging for a craft project! Your dining room table is a fabulous place to spread out and get creative. If you can expand your table with extra leaves, that’s even better! 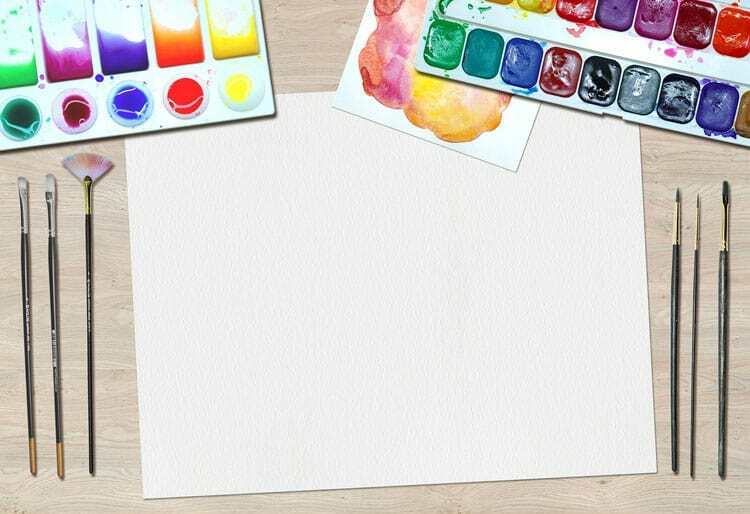 Protect your table from paint and glue by covering it with some scrap paper or an old tablecloth. Then get to work creating! 3. The living room: The living room is a nice place to craft if you like to create around friends and family, since it is where people often hang out. You can use the coffee table if you need a surface to work on, or if you’re creating something that won’t make a mess, the couch is a great place to craft. Any kind of knitting, hand sewing, and other small projects can be done on the couch. Growing up, my mother made quilts, and I always remember her spreading out on the living room floor to piece them together. There are a lot of options when crafting in the living room, and you can even catch up on your latest shows while you craft! That’s pretty much a win-win! 4. The office: If you have a home office or area with a desk, that is an ideal crafting space. Often times desks aren’t as in the way as the other areas of our house, and they’re typically just piled with random papers and other clutter and left to sit there unused, which makes them the perfect place to craft. Clear that clutter and take over that desk in your house and you have your own craft space! 5. A collapsible surface: While I have crafted at any and all of the above mentioned craft areas, more recently I’ve been using a collapsible card table, much like this one. Though it wasn’t originally purchased to be a craft table, I’ve found it is perfect for that purpose and have completely commandeered it for my personal use. It’s light enough that I can easily move it around to where ever I want. (It’s also great for taking blog pictures because I can move it to where the natural light is best.) Then when I’m done it just collapses and I can easily store it until next time. 6. A friend’s house: Why make a mess at your house when you can do it at someone else’s house? 😉 If you have friends who like to craft, they might be interested in hosting a crafting group get together. Crafting is fun, and crafting with friends is even better. It’s a great way to get some help and feedback and turn your craft time into a fun bonding experience. I find that I actually finish my craft projects quicker when I craft in an area that is “in the way.” I’m more likely to work on something when it’s out in the open, and that way my crafts aren’t taking up valuable real estate for too long and other members of the household don’t have a chance to get into them. So, where will you be creating your next craft? 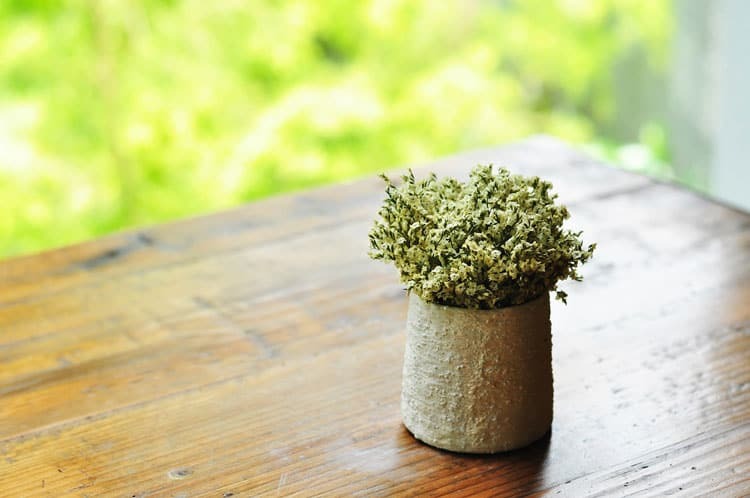 Just because you don’t have a dedicated craft space doesn’t mean you can’t create beautiful, one-of-a-kind DIY projects. You just have to get a little crafty and creative about where you do it. I mean we are crafters, after all, isn’t creative our middle name? 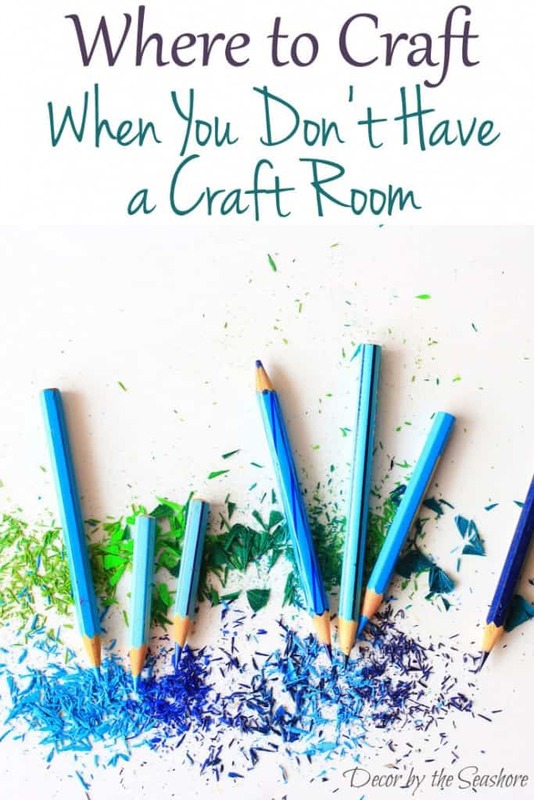 And if you’re crafting without a craft room, chance are you don’t have a lot of room to store your craft supplies. Follow these easy step-by-step instructions to organize and store your craft supplies in a small space. If you’d like to get my weekly newsletter full of fun craft and home decor ideas, don’t forget to sign up below! Celeste, I craft all over the house. I must have 3 different projects going on at the same time and I have a constant mess here. I wanted to finish one and then I ran out of staples then the other one.. well, it’s waiting for inspiration. Since I began this blog my house has never been messier and I like it that way. Where do you do your crafting? love your ideas, I too live in a small house and usually use the dining room table to work, which is easy because I am the only person in this house, so I don’t have to worry about dining space, and can make a space at the end of the table to eat.!!! I craft at my kitchen island! It gets the best light and it’s usually relatively clean. Visiting from Craftastic Monday party. That’s a great place to craft! If we had an island, it would probably be covered in my craft stuff, too! LOVE this! I have a very (very, very) small home, so crafting anywhere but my kitchen table is out of hte question! I totally understand, Morgan! It doesn’t matter where you do it, all that matters is that you get to craft and create!